This is an informational site for the proposed mixed-use development at 280 7th Street in Western SOMA, San Francisco. On these pages you can become more acquainted with the proposed building, its architectural design, the neighborhood context, and the approval process. Thank you for visiting and for your support. 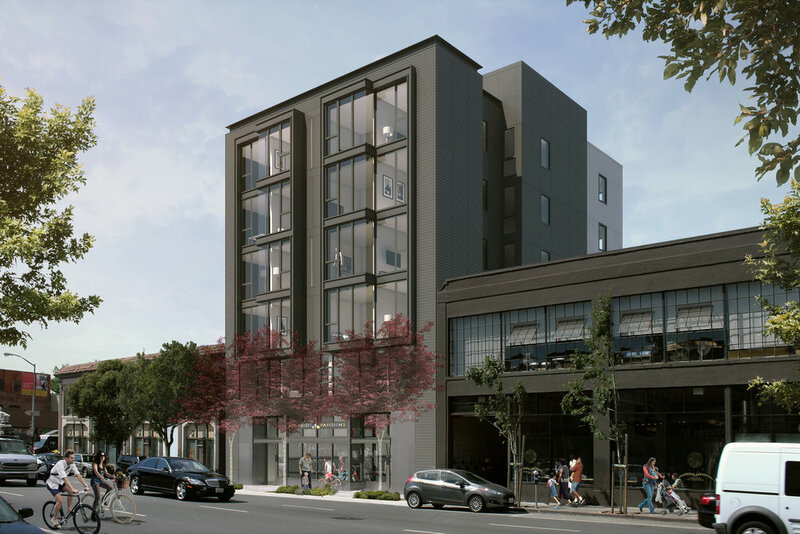 The proposed 280 7th mixed-use development consists of two new buildings that will add 20 residential housing units and a high-quality retail space to the Western SOMA neighborhood. The buildings will have on-site affordable units and will be car-free with convenient bicycle parking. The design draws from its context within the historic Light Industrial District and features modern detailing and a thoughtful use of materials and color. The two buildings, one facing 7th Street and the other Langton Street, offer different interpretations of this design approach. The proposed 7th Street building is organized with a traditional base, middle and top with proportions that relate to the immediately adjacent industrial neighbors. The building is clad with black terra cotta tile that is a modern interpretation of the district’s brick buildings. The building has 5 residential levels over a ground floor commercial and residential lobby. The commercial space features 25 feet of frontage and tall 13-foot ceilings suitable to a variety of neighborhood serving businesses. The proposed Langton Street building is a more contemporary style because it is surrounding by an eclectic mix of building ages, types, and styles. The building is clad in a smooth gray cement plaster that is a modern interpretation of the district’s concrete industrial buildings. It is highlighted by a glass bay projection that angles toward Folsom Street. The building has 5 floors and three residential units. Western SOMA has been a working-class community and home to warehousing and light industries since the 19th Century. In the 1960's, it became a center of the gay community in San Francisco, which is still apparent to this day from local businesses and organizations serving the Lesbian Gay Bisexual Transgender Queer (LGBTQ) community. In the 1990's there was significant redevelopment of the area, as loft-style condominiums - especially live-work developments - proliferated. The area became popular for technology start-ups during the dot-com boom, and today major software and technology companies have headquarters and offices in the area. The Project location within Western SOMA is ideal for commuters. It is located close to downtown and has easy access to both the 101 and 280 freeways and the Bay Bridge. The area is well served by transit, being within a block of several different Muni and regional bus lines and within three blocks of the Civic Center BART station. The Project is in close proximity to a wide variety of neighborhood-serving businesses, cafés and restaurants, nightclubs, and other amenities. It is in close proximity to many of San Francisco’s most popular destinations for arts, culture, and entertainment activities. For people with children or pets, there are several public parks in walking distance: Gene Friend Recreation Center, Victoria Manalo Draves Park, and Howard & Langton Mini Park. The 280 7th Street team was selected for their ability to integrate thoughtfully designed residences into an industrial environment. In particular, this team is recognized for creating a community-oriented living space with forward thinking design, that harmoniously blend ideas into the existing environment. 280 7th Street is a residence that stands apart because of the dedication and skill of its team. Dragonfly Group is an experienced property investment and development company specializing in single-family residence, condominiums and mixed-use projects throughout the San Francisco Bay Area. The company was founded by high tech entrepreneurs, Amit Haller and Ami Avrahami, who wanted to bring an inventive spirit to real estate development. Every Dragonfly property is characterized by a common set of core values: innovation, luxury, and sustainability. Workshop1 is a real estate development company creating modern, neighborhood-enhancing infill developments. Workshop1’s projects embrace sustainable practices, respond to community context, and are located in walkable, transit- oriented neighborhoods throughout the San Francisco Bay Area. Founded by architect, Mike Pitler and real estate broker, Will Mollard, Workshop1 delivers innovative projects of exceptional quality using an integrated approach to development. This form is for members of the community who would like to show their support for the proposed project. You may read the Letter of Support by clicking on the letter below. Items marked with an asterisk (*) are required. By selecting the "sign" button, you are signing this letter of support electronically. You agree your electronic signature is the legal equivalent of your manual signature on this letter of support. If you would like to send a personalized Letter of Support or have other questions or concerns, please contact us by email.